The Chesapeake Bay Trust Environmental Education Mini Grant Program awards up to $5,000 to support activities at schools that help promote awareness of and participation in the restoration and protection of the Chesapeake Bay and its tributary rivers and streams. Grants may be requested for relevant field trips, schoolyard habitat projects, watershed outdoor education, professional development workshops for teachers, or education materials, curriculum, and equipment that promote field-based Bay education. Spring projects should start no earlier than March 13, 2012. The deadline to apply is January 13, 2012. The Mini Grant Program is supported by a partnership with the National Oceanic and Atmospheric Association Bay Watershed Education and Training Program. For more information, click here for a Word document from the Chesapeake Bay Trust Website. Maryland’s 2009 Greenhouse Gas Reduction Act (GGRA) was designed to cut the state’s greenhouse gas emissions 25 percent by 2020. One provision of the Act called for independent studies to ensure that it improves reliability of electric service for consumers and industry, does not cause loss of jobs or significant increase in costs in the manufacturing sector, and will result in new, green jobs in the state. The University of Maryland Center for Integrative Environmental Research (CIER) announced on November 2 that it has completed a pair of studies and concluded that the 2009 GGRA will not cause problems for manufacturing. In addition, researchers expect it will lead to improved reliability of electric service, as well as new jobs. The Maryland Department of the Environment, charged with submitting a tentative Climate Action Plan (CAP) to Gov. O’Malley by the end of 2011, commissioned the studies. Read more about CIER’s findings here. So you just paid a million-seven for your 16 cylinder Bugatti Veyron and you’re wondering how much you should budget for your morning commute? Rest assured, the U.S. Department of Energy has the answer. DOE just added a handy Vehicle Cost Calculator to their Website. The tool allows you to make side-by-side comparisons of emissions and lifetime operating costs of thousands of conventional, hybrid, electric, and alternative fuel vehicles from model year 1996 and newer. The calculator was developed by DOE’s National Renewable Energy Laboratory (NREL). The Bugatti, by the way, will run you about fifty-cents per mile for gas, and add 27,700 pounds of CO2 to the atmosphere. Have fun with the calculator here. A November 2nd tweet led to this message on the Audubon Society Website: “Our Chevy Chase location usually has free compost bins for Montgomery Co. residents. Give us a quick call before you come over to pick them up. 301-652-3606. We also have books and free info on composting.” Can’t beat that! By the way, the same bins — used to compost grass, leaves and yard debris — are also available from Bethesda Green. It’s getting cold outside; soup weather is here. Consider, before you throw your vegetable scraps in the bin, turning them into home made broth and sauces. “Charis,” writing on the Mom’s Organic Market blog, suggests freezing your veggie scraps, bones, and apple cores, until you have enough of them to fill a soup pot, then boil them up for broth. You can read her suggestions here. And congratulations to Mom’s, who just opened a new market in Herndon. 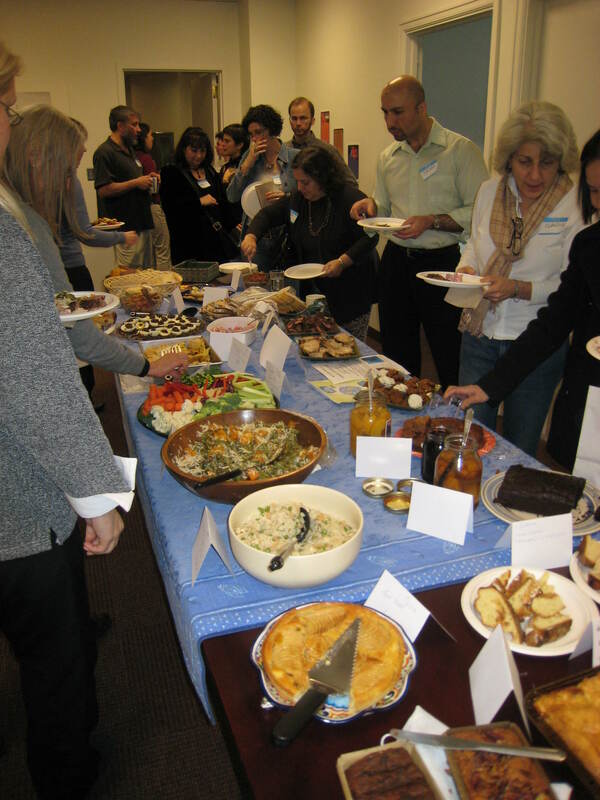 EV Learning Luncheon for Real Estate Professionals!, Thursday, November 10, 11:30 am – 1:00 pm, One Bethesda Center, 4800 Hampden Lane, Suite 200, Bethesda (at the Bethesda Metro Station). Presented by SemaConnect, the leader in EV charging stations and software in the Mid-Atlantic. Join others for an hour long educational session on the importance of EV charging stations in office, multi-family & retail commercial real estate. Registration and lunch are FREE. RSVP: naly.yang@semaconnect.com, 410-384-4223. Bethesda Green Education, Outreach and Marketing (EOM) Group Meeting – Newcomers Welcome! Thursday, November 10, 4:00 – 5:30 pm., 4825 Cordell Ave., corner of Woodmont Ave., Suite 200, above the Chevy Chase Bank, Bethesda. A team of volunteers, EOM supports all of Bethesda Green’s communication efforts. From recycling to energy efficiency, sustainability to green building/design, EOM expresses the organization’s various areas of expertise in a clear and concise manner via various media. New members are welcome to join. More information here, or contact Bethesda Green Communications Director Dave Heffernan, dvheffernan@bethesdagreen.org. “Save Our Streams” workshop, Saturday, November 12, 9:00 am – 5:00 pm, Izaak Walton League National Conservation Center, 707 Conservation Lane off Muddy Branch Road in Gaithersburg. Participants will learn to collect underwater insects and crustaceans – indicators of water quality – with minimal environmental impact. Participants will also learn to test for basic chemical properties, such as the amount of dissolved oxygen available for fish, and how to share results through the Izaak Walton League’s user-friendly website. At the end of the training, participants will learn about sites that need monitoring on Muddy Branch. Extra training will be available for those who want to engage children in learning about stream ecology with fun and simple hands-on activities. A registration fee of $30 includes lunch, snacks and all books and workshop materials. To register, visit http://sosworkshopmd.eventbrite.com. For more information on the workshop contact Leah Miller, Izaak Walton League Clean Water Program Director, at 301-548-0150 x219 or leah@iwla.org. Montgomery County’s first “Know Your Farmer,” Call-In Webinar, Wednesday, November 16, 8:00 pm. Montgomery Victory Gardens hosts “Challenges and Opportunities Facing Organic Agriculture in the 21st Century,” a discussion with Montgomery County farmers Nick and Sophia Maravell. Nick is the operator of Nick’s Organic Farm in Potomac and one of only four farmers sitting on the prestigious National Organic Standards Board, while his daughter Sophia, who has studied organic agriculture throughout the world, is one of our nation’s new generation of aspiring farmers. Register here. Montgomery County Green Business Crash Course Webinar, November 17, 8:00 – 11:00 am. Offered in partnership by Montgomery College and Montgomery County Chamber of Commerce. The course instructor will guide you through the application process to accelerate your certification. More info and registration. On November 23, a group of local citizens met at Bethesda Green to listen to a lecture on composting given by Alan Pultyniewicz, Recycling Coordinator for Montgomery County’s Division of Solid Waste Services. Alan Pultyniewicz delivers composting workshop at Bethesda Green. Composting is a natural process that happens when organic matter breaks down aerobically into a nutritious dirt-like substance that your garden and lawn will love. The best part about composting is that it’s free to do and keeps waste out of our area landfills. 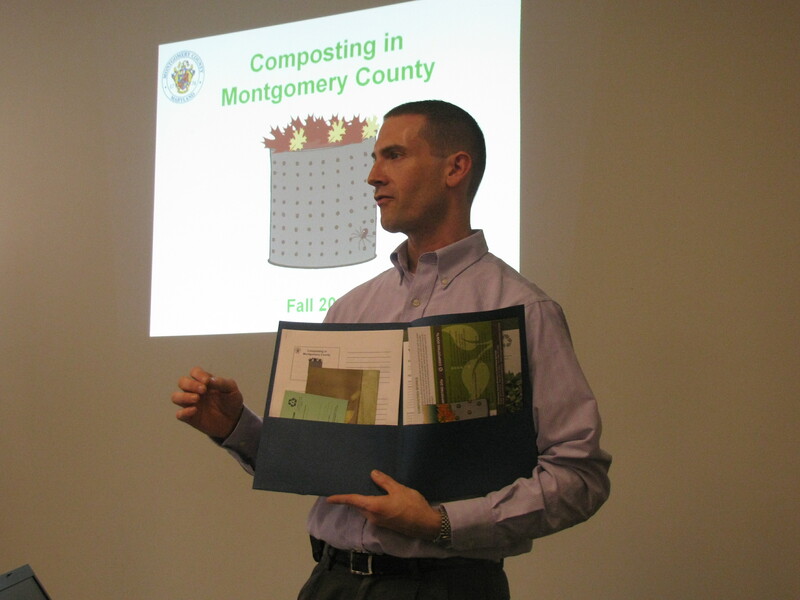 You can learn more about composting at Montgomery County’s website. When you are ready to get started, Montgomery County residents may pick up a free composting bin at Bethesda Green. To schedule a time to pick up a bin, send an email to info@bethesdagreen.org. Congratulations to Bethesda Urban Partnership (BUP) Director of Operations Jeff Burton and the entire BUP team on dialing up a fabulous day to enjoy the 21st annual Taste of Bethesda Saturday, October 2. Bethesda’s famous food and music festival, brings over 55 restaurants and four stages of entertainment to Bethesda’s Woodmont Triangle. Each year, more than 40,000 attendees sample the delicious restaurants, enjoy the live entertainment and visit the kid’s corner for face painting and arts & crafts. We’ll have to wait to get the official metrics from Jeff, but I’m betting this year was a record-setter. From the time booths opened at 11 am until closing at 4 pm, a throng of people filled the streets. Bethesda Green (and the Maryland Energy & Sustainability Cooperative, a BG Incubator company) shared tent space with Bethesda Cares (a community outreach program for the homeless), the BCC Regional Services Center, and other Montgomery County government agencies — all of us providing information to the public about our respective organizations. We passed out more than 40 composting bins, cleaning out the supply we had on hand. The free bins, provided by the county and used for leaves and garden debris, may be picked up at Bethesda Green. 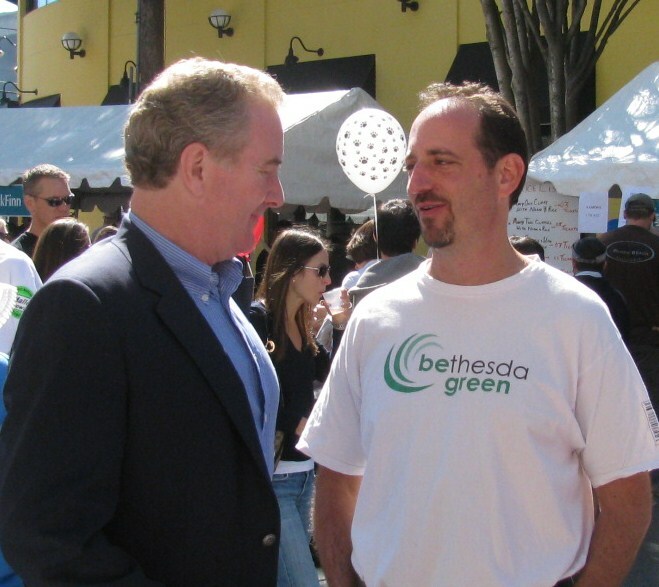 Rep. Chris Van Hollen (D-MD) and Bethesda Green Executive Director Dave Feldman share a moment at the Taste of Bethesda. It being the height of the political season, the Taste of Bethesda also attracted major candidates for numerous local, state and federal offices, including Congressman Chris Van Hollen, who has represented Maryland’s 8th District in Congress since 2002.